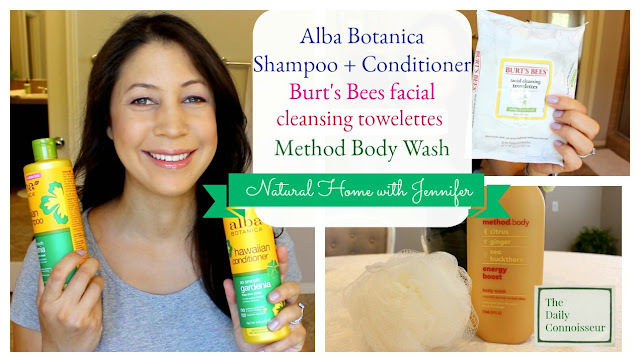 On today's Natural Home with Jennifer, I'm reviewing three beauty products: Method body wash in Energy Boost, Alba Botanica shampoo and conditioner in Gardenia (frizz-free), and Burt's Bees facial cleansing towelettes. "Turn your shower into the kind of escape you need right now. Whether you want pure peace, an energy boost, a deep detox or some simple nourishment, each naturally derived formula features a trio of nutrient-rich ingredients and a scent that’s sure to set the mood. No parabens. No phthalates. No bad vibes. Pure Peace is scented with peony, rose water and pink sea salt to soothe your soul and leave your skin oh so soft! Deep Detox will help you unwind and deeply cleanse with the power of cucumber, seaweed and green tea. 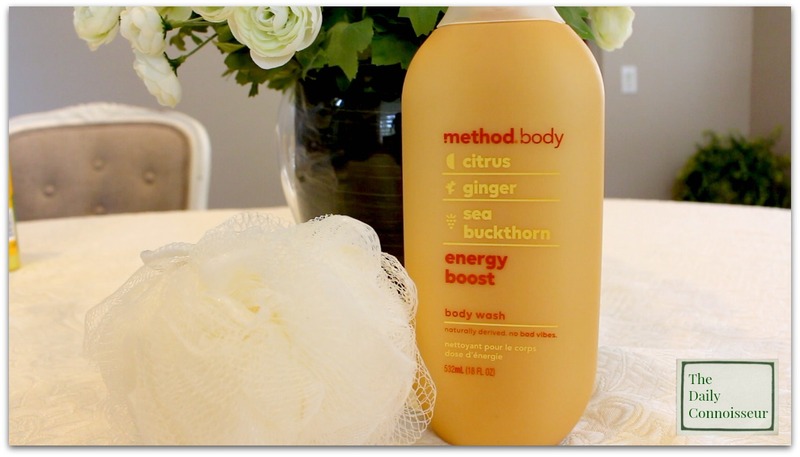 Energy Boost will leave your skin feeling soft and invigorated every morning with citrus, ginger and sea buckhorn. Simply Nourish with coconut, rice milk and shea butter to bring you this moisture packed body wash that will heal dry skin." A two-pack for the Method Energy Boost body wash is sold on Amazon, but it is way overpriced there at $39.00 for the two (!). On Grove it sells for $7.99 a bottle. "Shampoo: For a sleek, smooth style, take a permanent vacation from the harsh sulfates and heavy silicones in ordinary shampoos. Instead, discover Alba Botanica® So Smooth Gardenia Shampoo, a veritable silk infusion of gentle botanical cleansers and calming extracts. Gardenia extract and soy protein gently nourish the hair cuticle so even unruly hair becomes beautifully sleek and polished but never flat. Destination smooth. Conditioner: For a sleek, smooth style, take a permanent vacation from the harsh sulfates and flattening, heavy silicones in ordinary conditioners. 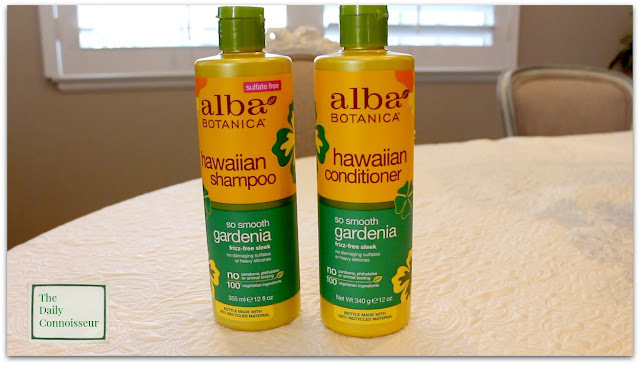 Instead, discover Alba Botanica® So Smooth Gardenia Conditioner, featuring botanical treats to weightlessly smooth your tresses. Gardenia extract, soy protein, and light tropical oils protect against humidity for all-day frizz control that gives a sleek, polished look with no oil residue. Destination smooth." I purchased the shampoo and conditioner from Grove as a set for $16.95, but I have also seen this in many other places, such as Target, Bed, Bath & Beyond, as well as CVS. You can also find it on Amazon as a 2-pack for the shampoo, and a 2-pack for the conditioner. The Burt's Bees facial cleansing towelettes cleanse away dirt, oil, and makeup. I like the thick cloths and find them effective in removing my makeup. When I first used them, I noticed my skin was reddened after use, which made me worried that I would have a reaction to the cloths. I continued to use them, however, and it wasn't an issue. Do you use these cloths? I would love to know if you had the same experience. As mentioned in today's video, for skincare, I am still using Belli Beauty , which is a natural skincare line for pregnant women that is approved by both OBGYNs and dermatologists. Healthy Glow Facial Hydrator, Pre-Treatment Scrub, Anti-blemish Cleansing Facial Wash, Belli acne control spot treatment. After the pregnancy, I plan to go back to Pellu (formerly Nudu) natural skincare. Be sure to watch today's video for expanded thoughts on all of these products. 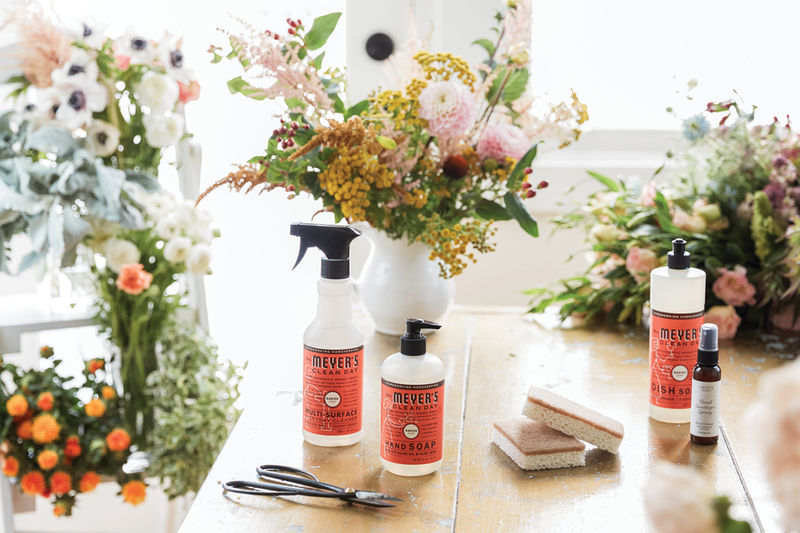 Please note: next week, I'll be sharing Grove's September special, which includes the Mrs. Meyer's fall scents. If you are interested in Grove and would like to wait for that special, it will debut next week. In the meantime, here is a link to Grove's August Special. I hope you enjoyed today's reviews. Please let us know if you have tried any of these products, or if you have a product you'd like to recommend, or have reviewed on Natural Home with Jennifer. Thank you, and I'll see you on Monday! In today's video I'm sharing the plans for my postpartum ten-item wardrobe. 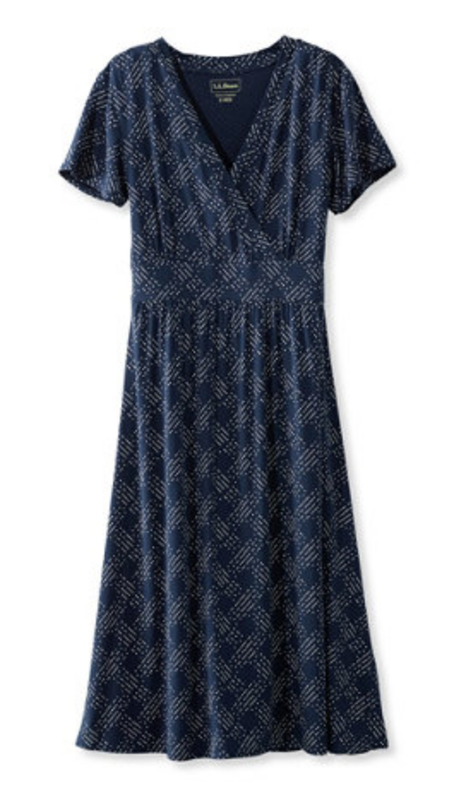 I'm going to have the baby very soon and wanted to be prepared with a nursing-friendly postpartum wardrobe for after the birth. This is the perfect time to go through my wardrobe as well as the seasons are changing. The two nursing tees are from zulily, who always have great maternity and nursing pieces that are affordable too. Also discussed in the video is my black fold-over skirt, as well as the demi-camisoles I wear under my v-neck tops and dresses. I am bringing back many older pieces as well that you will recognize. 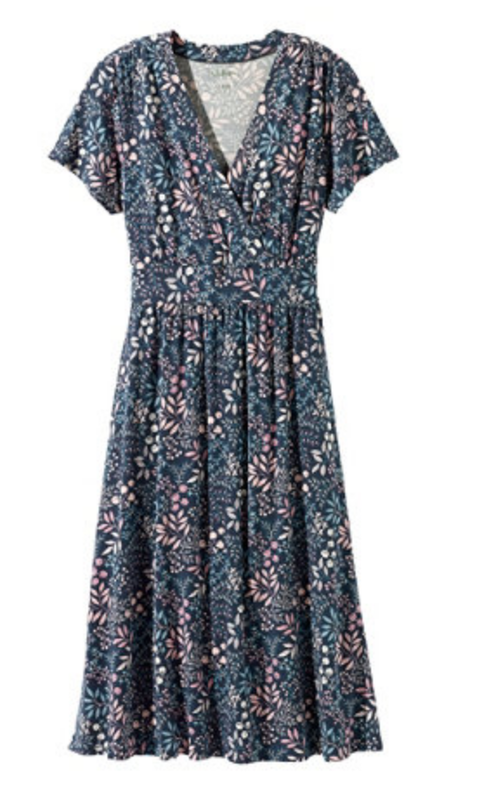 The burgundy Garnet Hill dress was from 2015/ 2016. 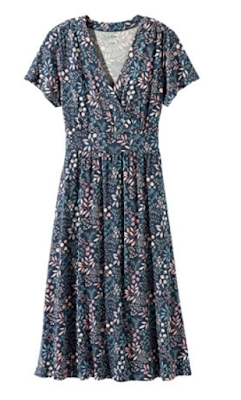 I had retired it but thankfully did not get rid of it yet as I think it will work well for my postpartum wardrobe. I will continue to wear a few items from my maternity wardrobe such as the maternity jeans and black v-neck dress, which were both purchased from zulily. My blog has been re-designed. I hope you enjoy the new look. I have a new feature on the blog called Shop where you can shop my books, eCourses and favorite things, including the specific ten-item wardrobe pieces for the season. On Monday's parenting chat video, Hoki writes, "Thank you for this. :) I particularly love the 'styling the sofa' one. My son will clean if we play "Surprise Guest Is Coming". We pick up toys, hurrying, because a surprise guest is coming. Then, I go out and ring the bell. When he answers, I come in and pretend to be an animal or a toy. He has to guess what i am. Then, he takes a turn. He REALLY cleans to play this game. Also, my favorite, general, affirmation is "What a useful little engine you are!" My son loves to hold the door for me and unload the grocery cart onto the belt. I wish he liked to helped me with the baby, though.﻿"
Hoki, I love your game, Surprise Guest. It must make it so fun for your son to clean and also build good, happy memories too. Thank you for sharing your tip with us! I would love to know your ten-item wardrobe plans for the upcoming season. Let me know in the comment section and your comment could be chosen as comment of the week on the blog. Thank you for joining me today. I'll see you tomorrow for a new Natural Home with Jennifer. In today's video, I'm discussing a very important parenting topic: encouragement! I share the ways that I encourage my children in their everyday tasks. We parents can be so busy and feel so overwhelmed with the work that we do, sometimes it's just easier to do it ourselves. But when we include our children and encourage their work, we help them to feel useful and take pride in the job that they do. The areas you encourage your children in might be different from mine depending on your life circumstance. But today, let's sit down together and come up with different ways we can encourage our children to be helps in the home. I encourage all of my children with the cleaning and come up with clever ways to make cleaning enticing. My son especially has an interest in helping me clean. I like to encourage their specific skills in academics and music. These are just some examples. Today, I would love to know how you encourage your children. Mentioned in the video: This is the wet/ dry vac that we have. It's the least expensive one on Amazon. It's not the strongest one on the market, but works for our small needs at home. "This is one of my absolute favorite self-care, style, lifestyle, get-your-act-together-and-respect-yourself, how to present yourself well to yourself and others without making a big effort out of it or acting like a snob books. 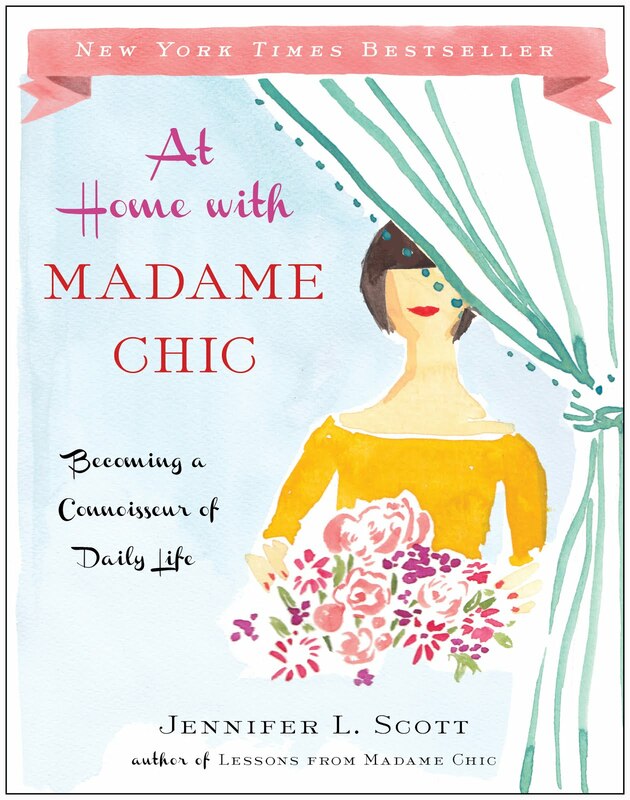 As a young adult the author traveled to France to live for a short time, and the lessons she learned there about fashion, food, home styling, self care and beauty routines changed her life forever. The most wonderful thing about this book is how simplistic it is! The tips and suggestions are simple, practical, logical, and easy to adapt for just about anyone anywhere. She makes a point of this by presenting the two families she lived with while in France and how even though the families were different (where they lived, their individual style) the principals of their approach to life is the same. This book is a great read for any age - from teens to young adults to anyone older, middle aged on up. There's no age restrictions on taking care of oneself! This book is also - although not presented as such - actually a money and time saver, specifically the tips about what to wear and beauty routines. Even the tips about what hair cut works best for each person make a lot of sense and are ultimately a time saver. This is the kind of book that readers will keep handy and refer to often. Sometimes I pick this book up and re-read different sections, especially if I need a style/care boost or a reminder why I should toss out those worn out sweat pants once and for all (ha ha). I highly recommend this book!" Thank you so much to everyone who reviews my books on Amazon and other sites. 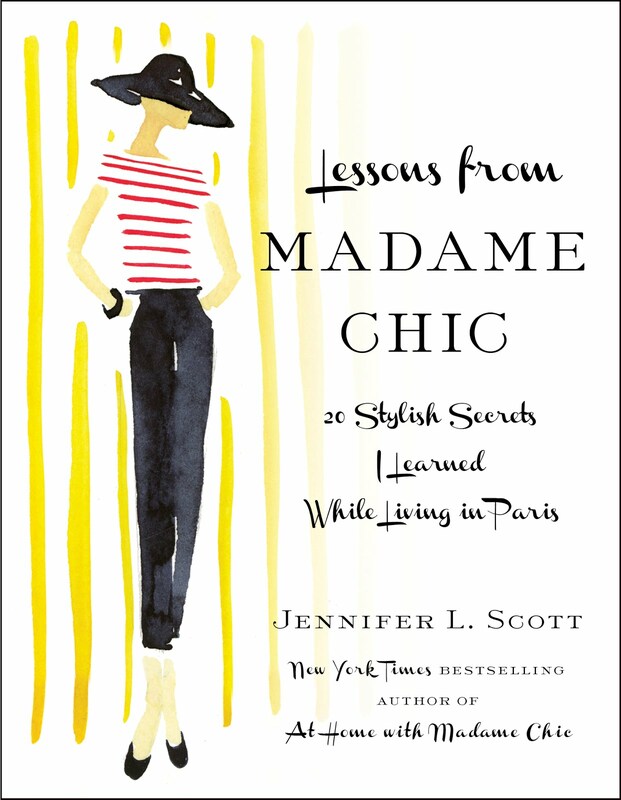 I really do appreciate you and how you spread the word about the Madame Chic series. Thank you for watching today's video. I would love to know your thoughts on the subject. 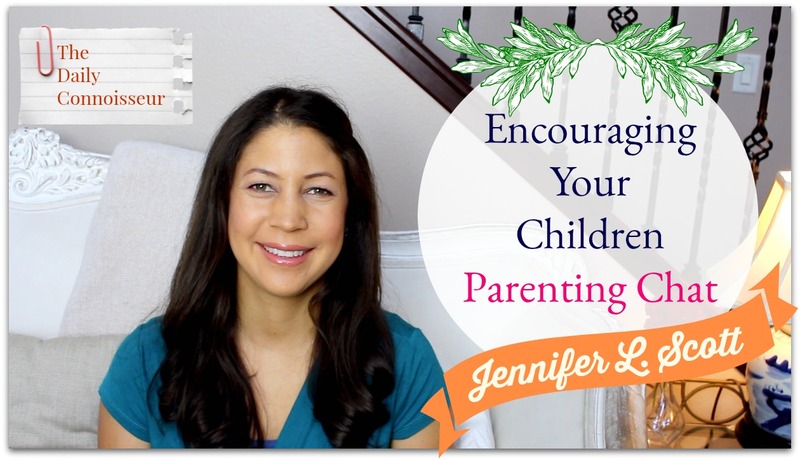 How do you like to encourage your children? What parenting topics are you interested in discussing on the channel? Where do you need help? What tips do you have for us? Let us know and your comment could be chosen as comment of the week on The Daily Connoisseur. I'll see you on Thursday for a ten-item wardrobe prep video! 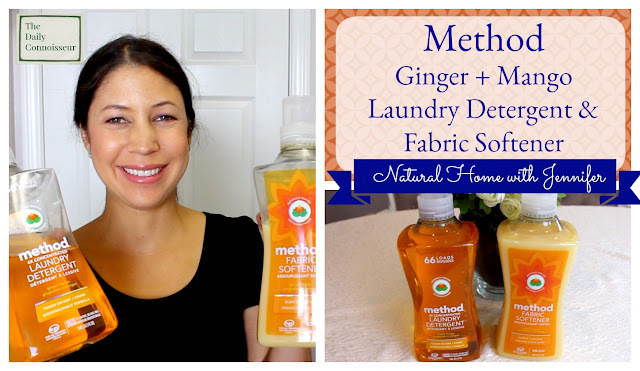 In today's Natural Home with Jennifer, I'm reviewing Method's Ginger Mango concentrated laundry detergent and fabric softener. I really enjoy using this line because it cleans our clothing well, gets stains out nicely, and smells so good. The ginger mango scent is really appealing and subtle. If you do not like scented laundry detergent, you should skip this particular one. If you do like scent, however, this is one of the best scents I've tried. - Naturally derived, concentrated laundry soap. - Keeps colors bright and whites white. - Concentrated formula delivers mighty cleaning power for he and standard washers. - Plant based, biodegradable and hypoallergenic formula fights tough dirt and stains. I purchased my laundry detergent and fabric softener from Grove Collaborative (which as of posting this blog, has the best price too), but you can also find the laundry detergent on Amazon (in a 4-pack), and fabric softener on Amazon (in a 4-pack). I have also seen this in the store at Target. For the Amazon links click here and here. I like to use Grove because of the free shipping, better prices, and frequent full-size gifts that they give their VIPs. I hope you enjoyed the review in today's video. 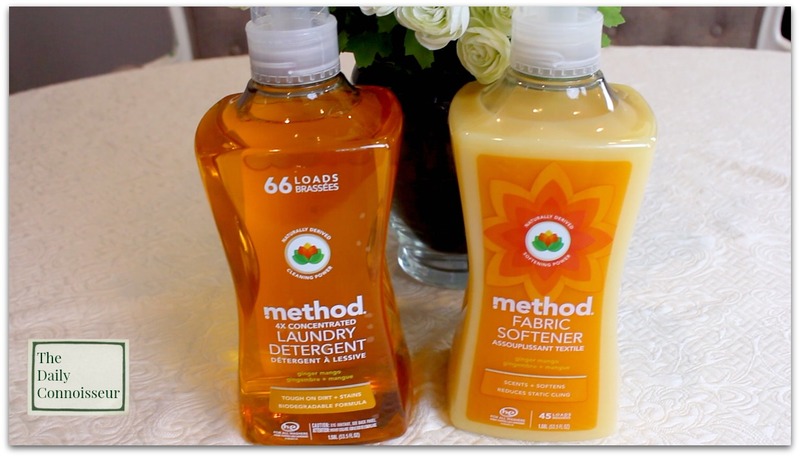 I would love to know if you've tried the Method concentrated laundry detergent. Do you have a detergent you'd like me to review on Natural Home with Jennifer? I promise to review an unscented detergent soon. :) Thank you and have a wonderful weekend! I am currently having my blog re-designed to be more functional. What you see today is a temporary design. Thank you for your patience during this time. The final result will be ready soon! 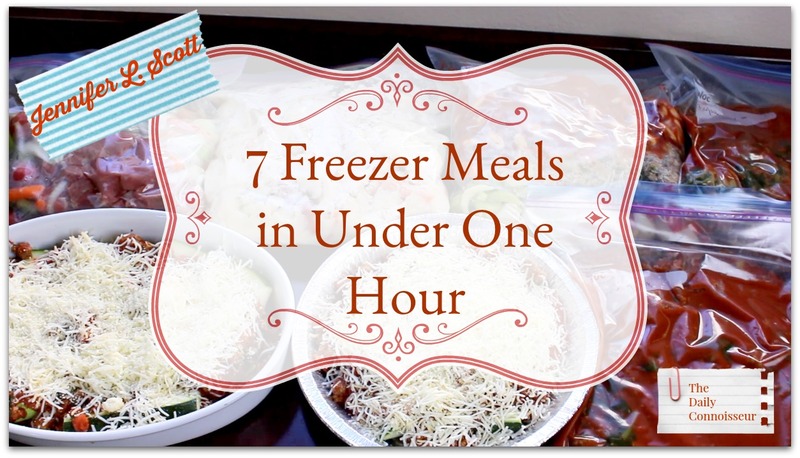 Today, I'm sharing some old favorites and new recipes in an all new freezer meal video: beef chili, bolognese sauce, chicken pot pie filling, beef stew, and zucchini lasagna. We had completely run out of our freezer meals so it was time I re-stocked the freezer. I love freezer cooking because you can accomplish a lot of work in a little bit of time (You know how I like to be efficient!) :) . On the days when I am too busy or too tired to cook, I simply pull out a freezer meal and am able to feed my family a healthful meal for a wonderful price. I have made the beef chili and bolognese sauce for you many times before, but for reference sake, am featuring the recipes here as well. I start by browning 6lbs of ground beef with 2 large chopped onions and 4 stalks of chopped celery. Once the meat is browned, I drain it and then add 1 lb of chopped spinach. Cook until the spinach is wilted. Season with salt and pepper. I use this ground beef base for 5 of the freezer meals: 1 beef chili, 2 bologneses, and 2 zucchini lasagnas. I even had a little left over, which I simply stored in a freezer bag for future use. Before we begin, these are the freezer cooking supplies that I reference in the recipes below (due to the redesign of my site, links are not currently showing up in different colors, so simply click on the word to be taken to the link): gallon ziploc freezer bags, aluminum 9x13 freezer pans (you can use regular casserole dishes too, but I use disposable pans when making a lot of meals), Instant Pot (6 qt), and slow cooker. In a ziploc bag, combine 1 to 1 1/2 lbs of the cooked ground beef mixture, chopped onion, chopped bell pepper, and chopped celery. Add one can of white cannellini beans, one can of red kidney beans, one can of tomato sauce, and one can of stewed tomatoes, along with salt and pepper. Seal and label the bag and store in the freezer. When you are ready to eat the chili, pull it out the night before to thaw in the refrigerator. Cook the next day in a large stock pot, or in the slow cooker for 8 hours on low. You can also cook this in the Instant Pot on high pressure for 22 minutes. Place 1 to 1 1/2 lbs of the ground beef mixture in each ziploc bag. Add your favorite jar of marinara sauce, or make your own. Add any additional vegetables you like. Seal and label the bag. Freeze. To eat, thaw the night before in the refrigerator. You can cook in a large stock pot, for 8 hours on low in the slow cooker, or 20 minutes in the Instant Pot. Serve over cooked spaghetti. Take one large zucchini, or 3 smaller zucchinis, and slice them into thick, steak-like pieces. 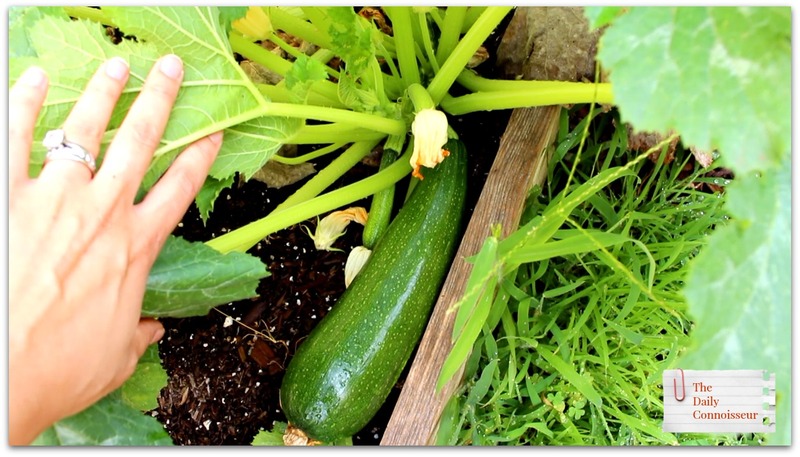 (Our zucchini was a giant! We picked it from our garden.) Mix 1 1/2 lbs of the ground beef mixture with your favorite marinara sauce. Spray the bottom of each casserole pan or aluminum freezer pan with cooking spray. Ladle a small amount of the beef marinara sauce on the bottom of the pan. Place a layer of your zucchini "steaks" on top of the sauce. Top with mozzarella cheese and parmesan cheese. Repeat the layers as you have room. Cover your casserole dish with foil, label and freeze. When you are ready to eat, thaw the night before in the refrigerator. Cook in a preheated oven at 350 degrees F for one hour, or until your lasagna is nice and bubbly. Please note, there are many variations you can utilize with this recipe. You can fry the zucchini (soak them in an egg/milk mixture, dredge in breadcrumbs, and fry in oil). You can use ricotta cheese in addition to the mozzarella (our children don't like ricotta cheese, so I omit it). You can add more vegetables and make this vegetarian by not using the ground beef. This is a wonderful dish for people trying to avoid carbs. Place 1 lb of beef stew meat in a ziploc freezer bag. Add 3 to 4 cups of stew vegetables (mine include onions, carrots, celery, and red potatoes, but you can use whatever stew vegetables you like). Place 1 quart of beef stock or beef broth. Seal, label, and freeze your bag. When you are ready to eat, defrost in the refrigerator overnight. Cook on low in the slow cooker, or for 20 minutes on high pressure in the instant pot. You can add fresh herbs and more vegetables (such as spinach or kale) on cooking day. You can also top with dumplings, which I like to do in the slow cooker. Feel free to modify the recipe as you need to. I reheated this from frozen for lunch one day in the Instant Pot and it was a hit! Served with large pieces of hot, crusty French bread with butter, it was delicious! Brown 1 lb chopped chicken in oil. Create a béchamel sauce by melting 1/2 cup of butter and mixing it with 1/2 cup of flour. Add 2 cups of chicken stock. (Traditionally, you add milk here, but I like the flavor of the stock for this recipe.) Stir until thickened. Season with salt and pepper. Cool. In a ziploc freezer bag, add the cooked chicken, stew vegetables (I use chopped onion, celery, carrot, and red potato- about 2 cups) and top with the béchamel sauce. Seal and massage the bag until the sauce coats all of the meat and vegetables. Freeze. Defrost in the refrigerator overnight and then cook in the slow cooker on low for 8 hours. You could also place the filling in a pie pan. Bake at 350 degrees for 1 hour. You can top this with your own pie crust (in that case, you can place the top of the crust on the pie and bake for the duration of the hour. Brush with an egg wash to keep golden brown. You could also top this with puff pastry. 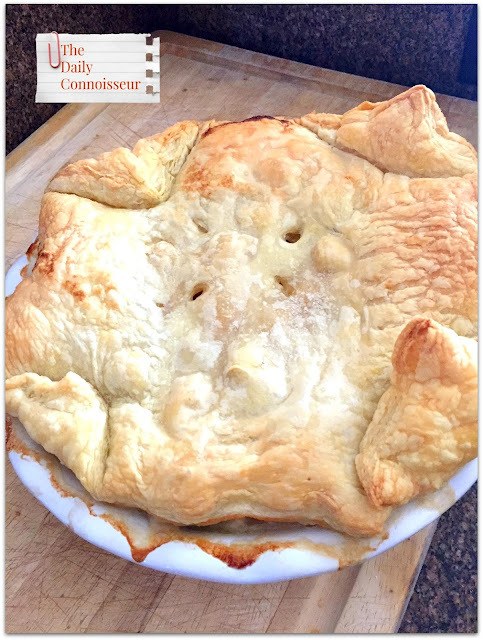 For this method, you will likely need to cook the filling first, then follow directions on the puff pastry package to see how long you cook the pastry on top of the pie (usually 20 minutes). You could also top this with biscuits, dumplings, or even cornbread. I reheated the chicken pot pie filling in the oven, then added a puff pastry crust for the last 20-minutes and it was delicious! I normally don't cook with a recipe for meals like these, I just use what I have on hand or what was for sale at the store. Don't worry if you don't have certain ingredients. Each of these recipes can be modified and are so easy to make. 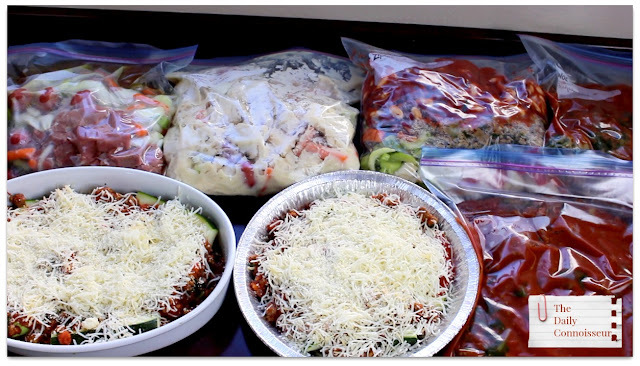 I hope today's video inspires you to try freezer cooking for your family. It's so nice to know that you have dinner prepared. Myrna writes, "Jennifer, I just now found your piano recitals! It has taken me down memory lane! I’m in my late 60’s and I grew up on a little farm in Missouri back in the 50’s. We had very little money. However, my father's family had lots of musical talent amongst themselves and played “bluegrass” and fiddle tunes...very country. I showed musical talent at a very young age (5) and my mother was determined I take piano lessons! She saved egg and cream money so she could pay for my lessons. Of course, as I matured, I began to be exposed to classical music and I really didn’t care for it! I would begrudgingly practice them and actually enjoyed the challenges! However, after 14 years of lessons and two different teachers, I learned every song you’ve played and developed a real love for classical music! Even my parents enjoyed my pieces! As I watched you play, it was like a glimpse into my past! I still enjoy sitting down and playing. It’s therapy for bad moods or sadness! I always get up and feel better after a practice session! Just wanted to share!" Hi Myrna, I loved your comment. I'm thrilled that the mini-performances on my channel and the discussions about classical music have brought back such great memories for you. And I think it's wonderful that you still play. Thank you for writing to us! I hope you enjoy today's video. I would love to know... do you make freezer meals? What are your favorite meals to make? Do you have any recipes to share with us? If you would like to share a recipe, I might be able to feature it in a future video on The Daily Connoisseur. I have the pleasure of interviewing Hilary from Old World Home in today's video. Hilary has a wonderful YouTube channel where she shares her fantastic interior design tips. Hilary's classic American style is refreshingly curated through affordable thrift-store and second-hand finds. We have a fun discussion about interiors, parenting, marriage, YouTube and more. I hope you enjoy today's video. On the Debt-Free Course, Janis writes, "This is a really inspirational course and full of common sense ideas. See if you can get the BBC in Britain to be interested in running it as a series as it is a life changing course Jennifer! Thank you." Thank you, Janis. I'm thrilled you enjoyed the course. 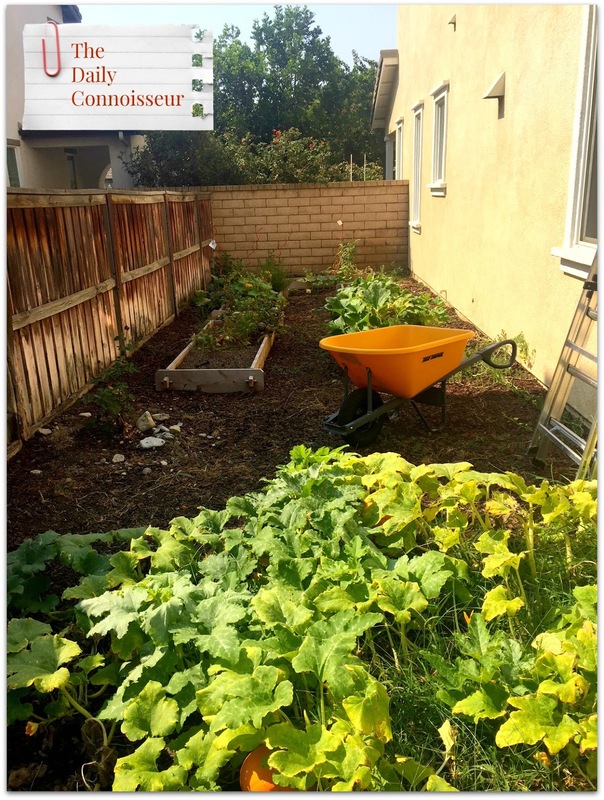 On last week's tour of our totally out-of-control vegetable garden video, Diane writes, "My mom every year makes ( meal in a pumpkin) cleans out the pumpkin stuffs it with a mixture of cooked rice, cooked ground beef, cream of mushroom soup, I think onion soup mix and maybe cooked mushroom. Then you put the lid back on pumpkin and cook in the oven until the pumpkin is really well done. the pumpkin browns a bit. Then you scoop out your rice serving by also scrapping a bit of pumpkin from the sides. It's so good and a real tradition in our family for harvest season." Thank you for sharing your mother's recipe with us, Diane. I would like to try this! It sounds perfect for fall. I hope you enjoyed my chat with Hilary today. I would love to hear your take on all of the topics we discussed. Your comment could be chosen as comment of the week on The Daily Connoisseur. See you on Thursday! FTC: This is not a sponsored post. All opinions are my own. When I first started my blog over 11 years ago, I did many posts on perfume and signature scent. Perfume is such a marvelous luxury and one's own signature scent is such a personal and telling fragrance. My love affair with French perfume started when I was 18 and visited the Grasse region of France to tour a major perfume factory there. The French love perfume and many French women have a go-to signature scent that they are known for. 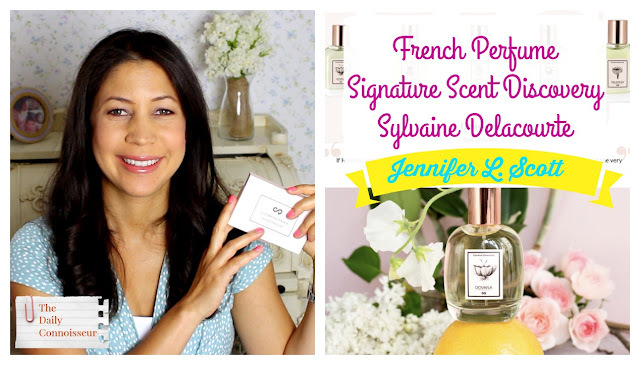 I was thrilled when artisan French parfumerie, Sylvaine Delacourte, contacted me to see if I wanted to sample and select one of their high-quality niche French perfumes. "Perfumes have the power to unleash emotion and to change your mood. 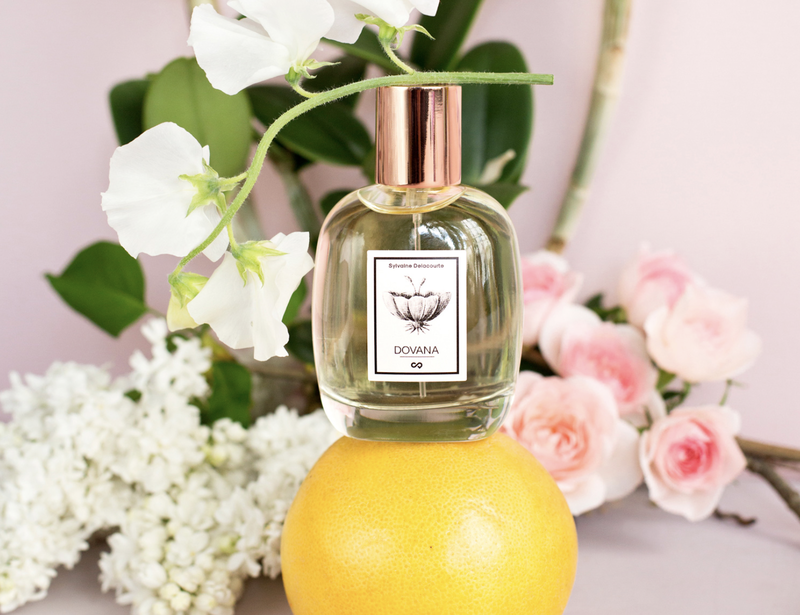 With her understanding of the mechanisms of the olfactory memory and using active listening skills, Sylvaine has been able to create perfumes which compliment our different personalities." Sylvaine Delacourte, former Creative Director for Guerlain, creates her perfumes around one iconic raw material and explores it in 5 very original facets. They offer a discovery box, as you'll see in today's video, where you can sample 5 of the perfumes in either the musk collection or vanilla collection for only $4, delivered from Paris to the United States. The videos on her website guide you on how the perfumes are made. They are fascinating! Once you sample the different fragrances and decide on your favorite scent, you can choose which size perfume you'd like. They charge $80 for the 1 fl. oz and $160 for the 100ml (which is the size I received). The travel sizes must be ordered separately. Sylvaine Delacourte also offers 20% off the first order, which is a lovely discount. Use the code, FIRST20. You'll get to go through the whole experience with me in today's fun video, plus see a picture of me at 18 visiting the perfume capital of the world in France! I chose Dovana from the musk collection as it was my absolute favorite. 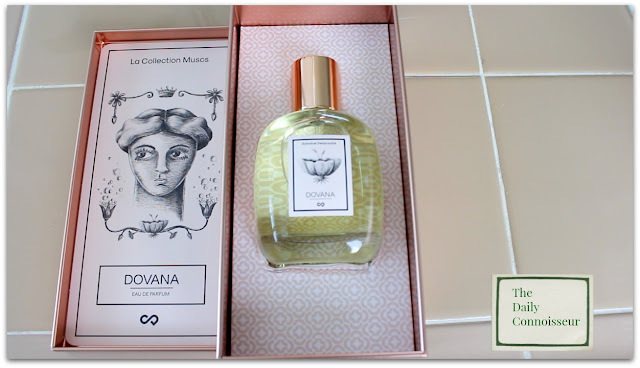 The perfumes are exquisite and I hope to try the newly released vanilla collection in the future. Thank you to Sylvaine Delacourte for sharing your wonderful company with us! Please note: this is not a sponsored video and these links are not affiliate links. 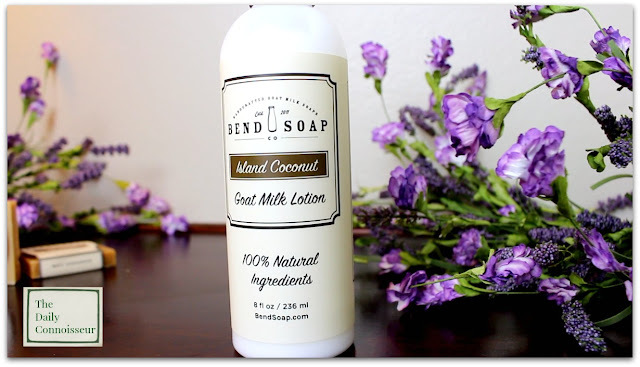 On last week's Bend Soap Co. review, Mimi writes, "Oh, Jennifer! I could kiss you! I have been experiencing a bout of eczema, and borrowed a book from the library that extolled the virtues of goats milk for this. Unfortunately, the writer of the book, who has goats and makes goats milk products lives in Scotland and doesn't ship to the states. I've been improvising on my own by drinking goats milk kefir and also slathering it on my itchy patches. I also found goats milk soap from Zum. But I really needed a body lotion! Your post was so timely! I immediately clicked on the link and did me some ordering! I am so happy!" Hi Mimi, I'm so happy! That was the reason they started their business was to create a product for their son's eczema. Come back and let us know how they work for you! I love when my reviews can help others. Thank you for joining me today. I hope you enjoyed this fun video. Have a wonderful weekend and I'll see you on Monday. After being inspired by the kitchen garden at Anne Hathaway's cottage in England, as well as the grand gardens at Hampton Court Palace, my family decided to plant our own humble vegetable garden chez nous. It's been a fun year with a major learning curve and boy, did we learn a lot! We learned that we can grow gigantic zucchinis, great tomatoes, pumpkins (on accident) and... WEEDS. In today's video, I take you on a mini-tour. This video was shot back in July (on my birthday!) and since then, we've had some updates to the garden. 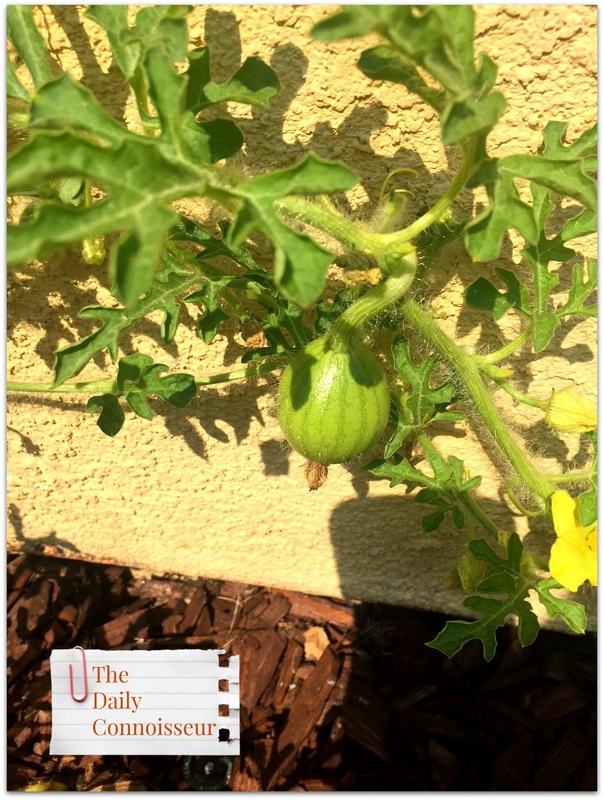 I discovered that what I thought was a melon, is actually a spaghetti squash! (Note to self: label the vegetables next time). The butternut squash is coming in nicely. 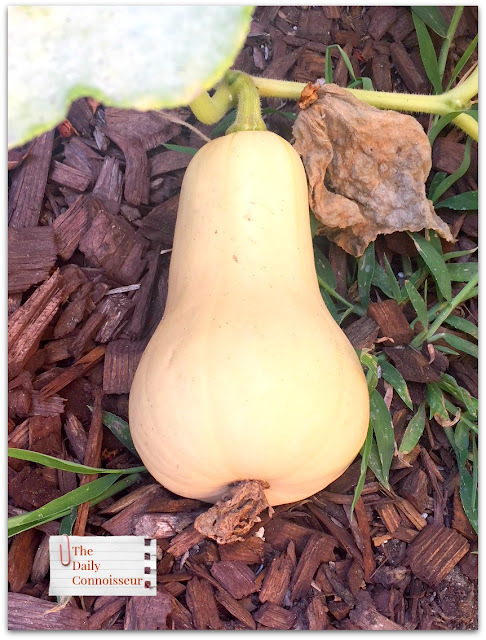 We grow squash well here! 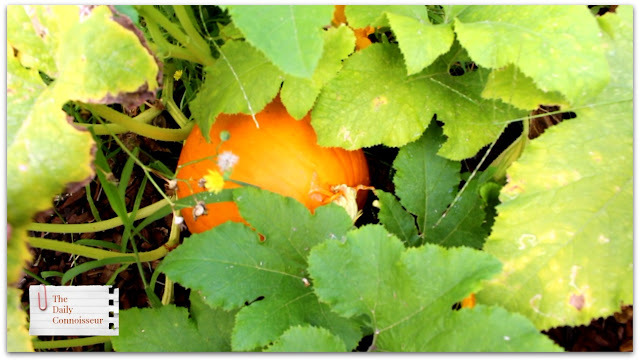 I'm looking forward to making soups, pies, and casseroles with the squash once fall is here. We have some watermelon coming in too! We also had our garden weeded out. It looks a lot better now. Thank you for joining me for today's video. I hope it brings you joy. I have completed my first round of copyedits for my new book, CONNOISSEUR KIDS, which is coming out next year from Chronicle Books. I'm so excited! I love this book and know you will too. On Monday's blog, Refuse to be Dumbed-Down DETOX, Woman of the House writes, I have strong opinions about children and pop music. We do not do them any musical favors by submerging them in that style and genre. It ruins their voices when they try to imitate what they hear and it takes time away from learning the music they should be learning, such as traditional children's songs and folk songs. It also develops their taste for pop styles and it's hard to cultivate in them a taste for good music. This quotation from J.S. Bach sums it up well: "​The best method of instructing youth, therefore, is to accustom them to what is good. The right understanding of it follows in time, and can then still further confirm their attachment to none but genuine works of art." I love the quote from J.S. Bach. Thank you for sharing it with us! I couldn't agree more. Thank you for joining me for today's video. 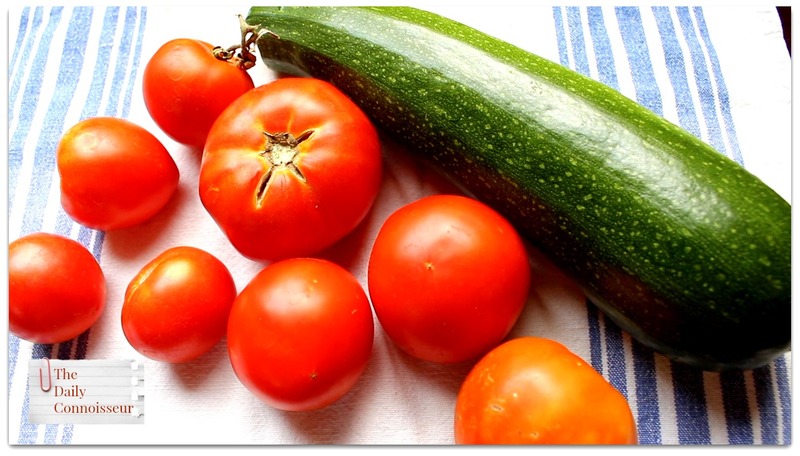 I would love to know... do you grow fruits and vegetables? 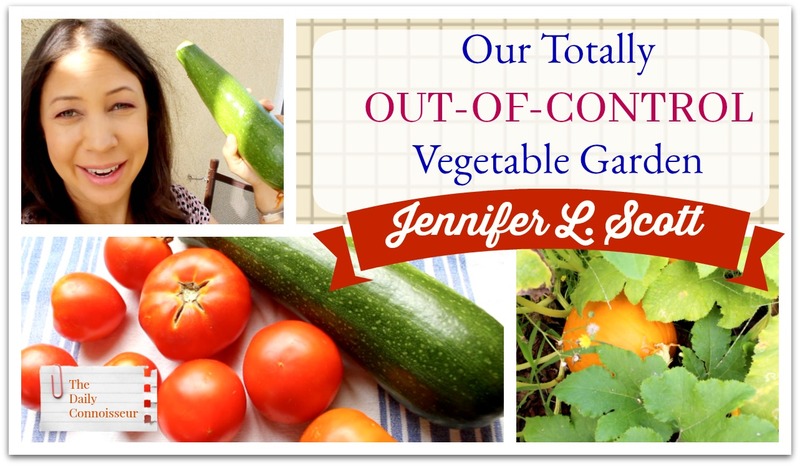 Do you have your gardens under control? What's your secret? 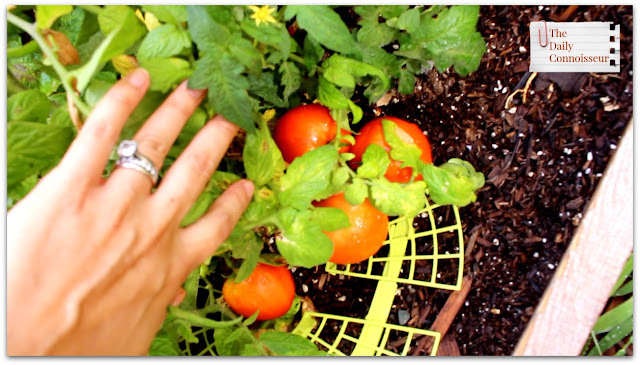 What are the things you grow best in your area? Let me know and your comment could be chosen as comment of the week on The Daily Connoisseur. 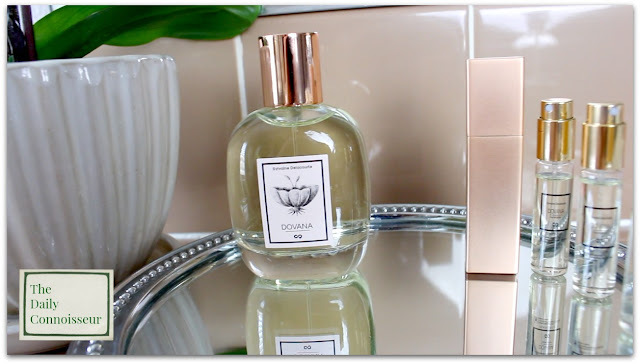 I'll see you tomorrow for a fun French perfume post! 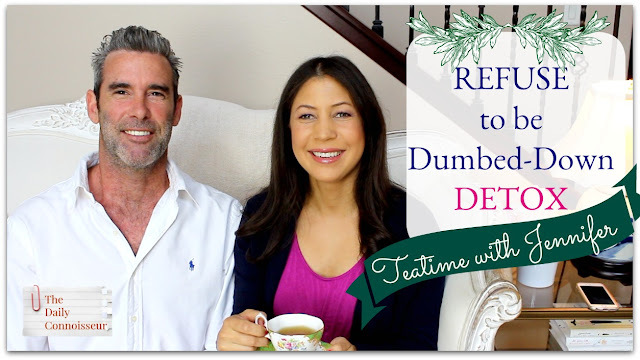 Today's Teatime with Jennifer discusses a very important subject in our modern society: refusing to be dumbed-down. "Dumbing down is the deliberate oversimplification of intellectual content in education, literature, and cinema, news, video games and culture." Mentioned in today's video: The New York Times article which shares that the average American adult watches more than 5 hours of television a day. Also mentioned in today's video, 10 benefits to listening to classical music. I mention my song of the summer, Adagio by Albinoni. Check out this rendition by cellist, Hauser, on YouTube. It gives me hope that this performance has seen over 15 million views. I love listening to books on Audible.com Audible is a subscription service that gives you access to the world's best audio books. 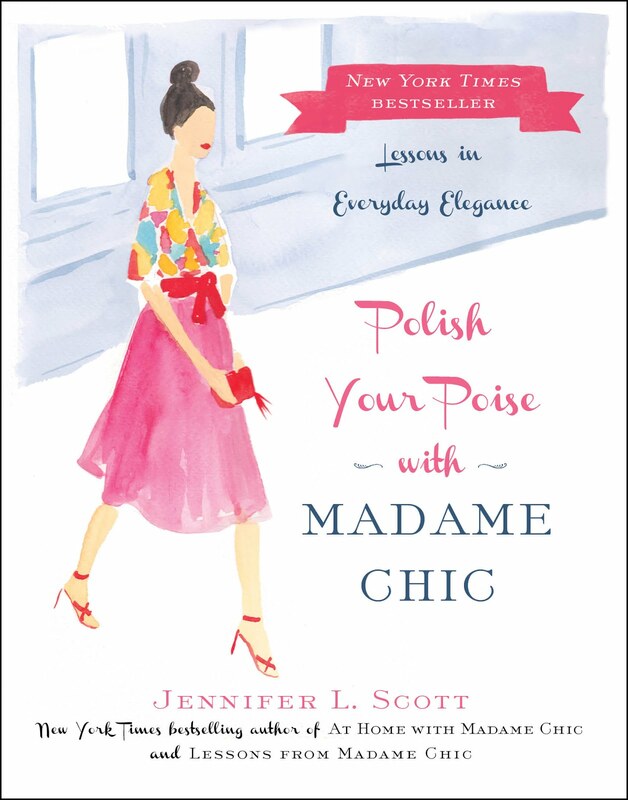 Did you know The Madame Chic books are on audible.com? Right now I'm listening to Mayflower, by Nathaniel Philbrick. I highly recommend this book! I hope you enjoy the discussion in today's video. Please let us know what you think about all of the topics discussed. I love to hear from you. 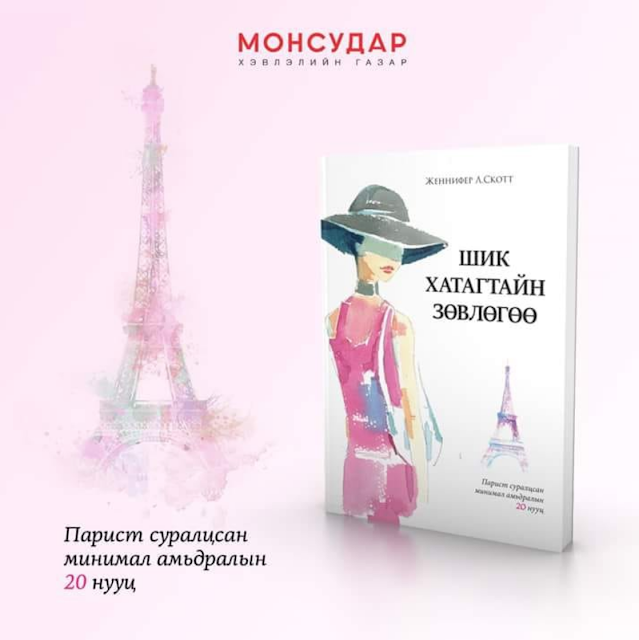 Lessons from Madame Chic is now available in Mongolia! Thank you to the Mongolian readers who have shared picture of their book on social media. On the Ten-Item Wardrobe eCourse, Terri writes, "Jennifer, thank you so much for this course. Your books and vlog have improved my life in so many ways! I'm struggling to create my Ten-Item Wardrobe but with your help I've cleaned out my closet and discovered my personal style." Terri, I loved reading your testimonial. Please update us and let us know how your ten-item wardrobe is coming along. Regarding last week's Mapp and Lucia book club, Josephine writes, "Thank you for recommending these books. I thought the books were very entertaining and thought provoking about psychology of human behavior and nature. Personally I loved the character of Miss Mapp because she was clever in practical ways. Lucia was more polished socially but her vanity was off putting to me. I also enjoyed your commentary. I think you have brought up a good point when you mentioned when Lucia was upset she turned to practicing piano. I took it a little bit further and thought of our children how it is important to offer kids classical education where they can learn to play an instrument or paint so in their distress they have a great way to express and distract themselves. Your point of formal way to address someone is great too. I took it little bit personal and thought of my own husband and kids. When we talk and use formal manners everyone slows down , has time to react but not overreact. Our manners convey respect for each other. Thank you for doing this video. I really enjoyed it." Hello Josephine, I enjoyed your insights into the books and commentary. Thank you for joining me for the book club and I hope you will continue with us for the next installment. Thank you for us for today's video. I would love to hear from you. What do you think about the dumbing down of society? Your comment could be chosen as comment of the week on the blog. 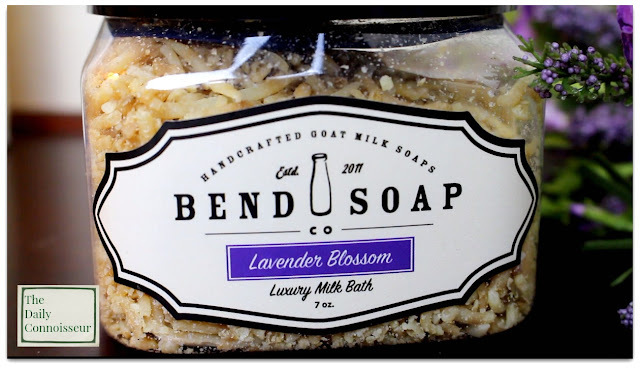 In today's Natural Home with Jennifer, I am highlighting a wonderful family business, Bend Soap Co.
Based in Bend, Oregon, this marvelous small business produces high-quality, 100% natural body products made from fresh goat milk (from their own goats!). 100% natural, their goat milk soap cleans and moisturizes beautifully. I love the soap! It's perfect for sensitive skin. Bend also created their soap to help their son who had eczema. The soap is very versatile (see Bend's description below). I was intrigued that the goat milk soap can be used as a shampoo, so I tried it last week. It cleans the hair very well. It certainly does not have the same texture as a traditional shampoo, but my hair and scalp felt very clean. It’s Handcrafted: Not all goat milk soap is created equally! Here at Bend Soap Company, we only use fresh goat’s milk (from our very own goats!) and natural, non-GMO oils to make our soap from scratch. This makes it the very best! It's 100% Natural: Your skin is your body’s largest organ and it needs certain nutrients to look great and perform at its best. Studies show approximately 60% of what you put on your skin is absorbed into your bloodstream which is why we only use all-natural ingredients — no dyes, harsh chemicals, parabens, alcohols, fillers, artificial fragrances, GMO ingredients, synthetic preservatives… No JUNK! It’s Moisturizing: Whether you live in a dry climate or suffer from skin conditions like eczema or psoriasis, each bar of our goat milk soap cleanses and refreshes dry, damaged skin while also helping to maintain your skin’s natural moisture. It’s Nourishing: Found naturally inside goat’s milk, alpha hydroxy acids slough away dead skins cells with ease, allowing the blend of rich oils added to our bars of goat milk soap to sink into your skin and nourish the new skin cells below. The end result is skin that looks and feels younger. It’s a Multi-Use Product: One single bar of goat milk soap can safely and effectively be used as an all-natural replacement for body wash, face wash, shampoo, bubble bath, and shaving cream. Hop in the shower, lather up, and rinse away — it’s that easy! For maximum benefits, use in the shower alongside our sugar scrub and seal in the moisture with our goat milk lotion. I requested the milk bath specifically to try from Bend. I love milk baths and always have. The shaved goat's milk soap that comprises this delightful milk bath is very moisturizing. The lavender scent is wonderful and natural. Milk baths are great for your skin, but who has, or can afford raw, fresh, raw milk? Instead, draw yourself a relaxing bath using our milk bath — the milk bather’s economical choice that’s a relaxing treat for the body and senses! Each container of our all-natural milk bath contains curls of our goat milk soap which quickly dissolve when added to a warm bath, turning the water a beautiful milky white color and infusing the tub with alpha hydroxy acids which are naturally found inside goat’s milk. As the curls of goat milk soap dissolve, the milk bath gets to work while you soak, releasing the delightful aroma and therapeutic qualities of essential oils and leaving your skin soft, supple, rejuvenated, and moisturized. The perfect self-care treat for both men and women, even just one soak in our all-natural milk bath will let your mind unwind while making your skin look and feel it’s best. Our milk baths are perfect for adults and can also be used as an all-natural bubble bath replacement for the kids! 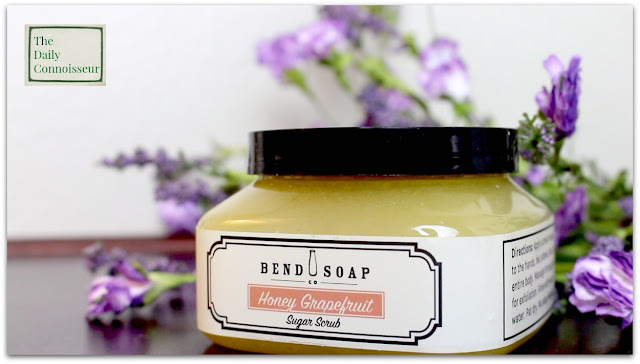 Molly from Bend Soap Co. mentioned that the honey grapefruit sugar scrub was one of her favorites. It is the nicest sugar scrub I've ever used. 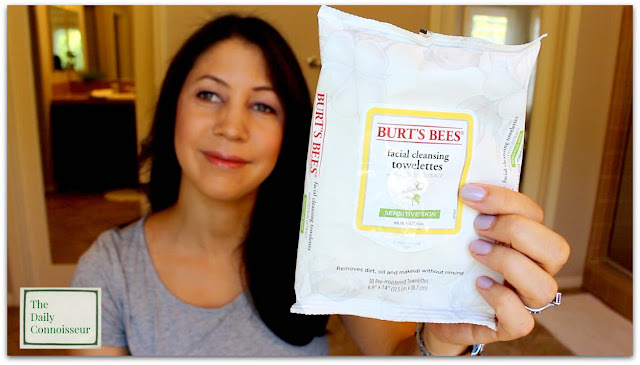 The high-quality sugar exfoliates the skin and the oils moisturize deeply. You do not need to wear a lotion after using the sugar scrub, as the moisture lasts all day. It doesn’t matter if you’re a man or woman, when it comes to keeping your skin in tip-top shape, exfoliation isn’t something to skimp out on! Exfoliating the skin allows you to scrub away dead skin cell buildup on the body, revealing newer, younger looking skin. Here at Bend Soap Company, we handcraft each batch of our sugar scrub using a limited number of all-natural ingredients that work with your body. When we say “all-natural lotion,” we really mean it. No alcohols, dyes, parabens, phthalates, synthetic preservatives, artificial fragrances, GMO ingredients (including corn or soy oils), or other chemical components will ever be found in our lotions. It’s also 100% biodegradable, hypoallergenic, and gluten free. Here’s what you WILL find inside our goat milk lotion: water, goat's milk, shea butter, rice bran oil, vegetable source natural emulsifying wax, palm stearic acid, aloe vera, vegetable glycerin, natural and organic scents, silver dihydrogen citrate, potassium sorbate, and citric acid (natural preservatives). 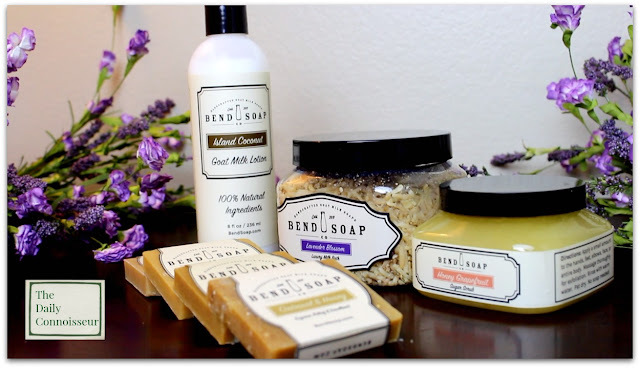 Thank you to Bend Soap Co. for sending me their wonderful products to review on Natural Home with Jennifer. They gave me a special discount code for Daily Connoisseur readers: Get 10% off your first order by entering the code DC10 at checkout. I hope you enjoyed today's video! Thank you for joining me on the blog this week. I'll see you on Monday. FTC: This is not a sponsored post. All opinions are my own. Bend Soap Co. sent the products for me to review. This post contains affiliate links. The readers of The Daily Connoisseur give me the best recommendations. A few years ago, a reader suggested I try the YSL Faux Cils mascara in burgundy. It was love at first use and that has been my favorite mascara ever since. The only thing I don't love about the YSL mascara is the price. The mascara generally sells anywhere between $27 and $32. When I visit Sephora, I usually purchase two of them, and that carries a hefty price tag. I was really excited when I heard from a few readers recently that L'Oreal put out their own burgundy mascara, with a much more affordable price tag. In today's video, I'm comparing the two mascaras and give you my thoughts. Does the L'Oreal mascara make a good dupe for the YSL? Find out in today's video. I applied the L'Oreal Voluminous Primer Mascara first. This step really helps to make the mascara last and appear thicker on the lashes. Then I applied the L'Oreal Paris Voluminous mascara in deep burgundy. I compare this duo with my favorite YSL Faux Cils mascara in burgundy, which is an excellent mascara, but also very pricey. After comparing the two, I am very impressed with the L'Oreal version. I wore the two mascaras on a very hot day when I spent a lot of time outside and neither one of them crumbled or smeared. For anyone looking for a more affordable alternative to the YSL mascara, this makes an excellent dupe. Thank you for being a great inspiration to me. As a fairly new wife and less than a year into motherhood, your advice has helped anchor my household in many ways including how to be a good steward of a thoughtful, well put together closet. Thank you, Kathryn! I'm so pleased you enjoyed the course! Angela B. writes, "I have a Bachelor's degree in Communication and a Master's in Business and can tell you how important it is to have this discussion. The use of social media is more often times than not, a form of communication that people use to "frame" their lives in such a way they appear to be more ____________________ than what they really are. Fill in the blank - well off, well traveled, successful at parenting, educated, well liked, admired for their looks, etc. - when in fact, they are no better than anyone else. Bottom line - the beauty of our lives lies in the journey, the successes AND failures, the joys AND the sorrows, the triumphs AND the struggles - it is our ability to recognize that value and treasure each and every moment that results in true happiness and contentment. Each journey is unique and above all valuable...joy should come not in having others applaud yours, but in lifting others up and cheering them on through the difficult times." 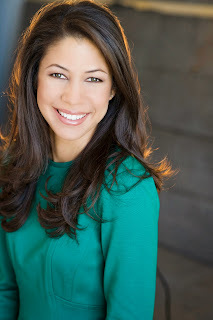 Hi Angela, I really enjoyed your perspective on last week's social media video. I couldn't agree more! Thank you for joining me today. I would love to know if you've tried L'Oreal's mascara. 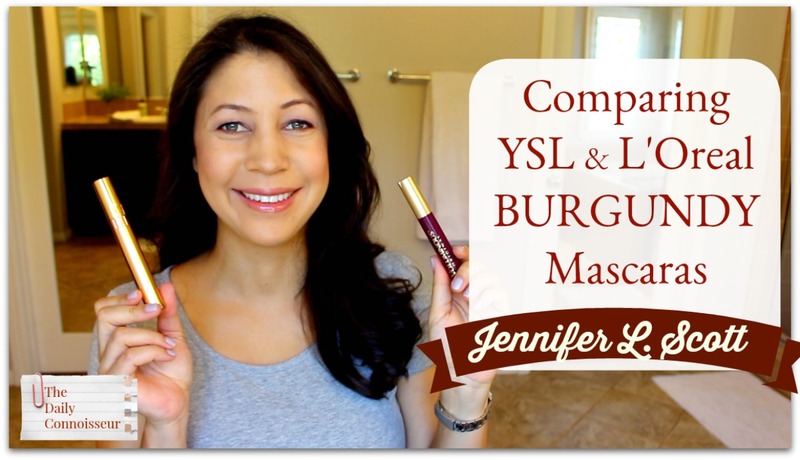 Have you heard of any other burgundy mascaras on the market? Let us know and your comment could be chosen as comment of the week on The Daily Connoisseur.